No-one likes to be hacked, but with the growing prevalence of the internet and computing systems in every corner of our lives, this risk of falling victim to cybercrime is growing by the day. While this presents a risk to households, business and governments, however, as investors this may also present an opportunity. After all, demand for cybersecurity services is exploding around the globe. According to estimates by cybersecurity firm McAfee, the global cost of cybercrime is now around 0.8% of global GDP, or $US600 billion per year. McAfee estimates nearly two-thirds of people online have experienced some form of data hack. At his annual shareholder gathering last year, investment guru Warren Buffett even suggested cyber-attack was today a bigger threat to humanity than nuclear weapons. The costs of cybercrime are only likely to escalate further. In the next two years to 2020, Microsoft estimates the number of people connected to the internet globally will double, from 2 billion to 4 billion. And by that time, internet data volumes will be 50 times greater than today, with more than 50 billion devices – from everyday household appliances to complex business machinery – connected to the internet. All these users and internet-exposed devices will need protection. According to Gartner Research, global spending on cybersecurity has increased at an annual rate of around 8% since 2011, forecast to reach $US96 billion by the end of 2018. 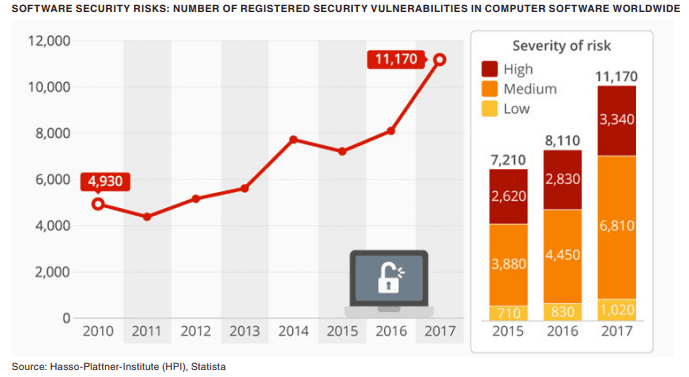 As seen in the chart below, the number of software security vulnerabilities is at an all-time high, with some 11,170 security risks being registered worldwide in 2017. 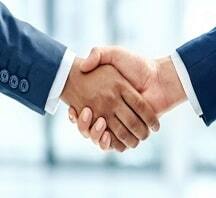 How can investors gain exposure to this investment theme? Thanks to the advent of exchange traded funds (ETFs) which trade on the ASX, it has never been easier. The BetaShares Global Cybersecurity ETF (ASX Code: HACK), for example, provides investors an easy and transparent way to gain diversified exposure to some of the world’s leading cybersecurity companies. HACK invests in around 30 of the world’s largest global cybersecurity firms outside of Australia, which at end-June 2018 had an average market capitalisation of $A21 billion. Among the major companies held by the Fund, Symantec Corporation is one of the world’s leading providers of virus protection and intrusion detection systems. Cisco Systems, moreover, is the world’s leading supplier of computer networking equipment. As might be expected given the strong growth in demand, revenue growth by companies within the Index that HACK aims to track has been particularly impressive – with annualised growth of 105% p.a. over the five years to end-June 2018, or around 20% more than that of companies in the S&P 500 information technology sector. In the 12-months to end-July 2018, the HACK ETF returned 31.8%, with annualised returns of 18.7% since its launch on the ASX in August 2016 (of course, past performance is not indicative of future results and the value of an investment may go down as well as up). Given we are all likely to face data hacks of some kind in coming years, it’s nice to know there is one investment product available, at least, that seeks to profit from growth in demand for the services that will be trying to protect us. Learn more about the BetaShares Global Cybersecurity ETF (ASX: HACK). “The Economic Impact of Cybercrime: No Slowing Down” McAfee and Center for Strategic and International Studies, February 2018. Our partner businesses are invited to pen articles that offer unique insight from within the industry for the benefit of our readers. If you read something you would like to learn more about you can contact our partners direct or we are happy to put you in touch. People get less for manslaughter/murder.